My name is Wizard and first of all, I am absolutely gorgeous. I’m not being conceited here, it’s true. I’m sleek and all black, every bit of me, and I weigh a very impressive twenty pounds! I’ve worked very hard at keeping my weight up and staying buff. When people meet me, they stare in awe. Actually, I think I look more like an ocelot (admittedly a first cousin) than an everyday house cat. Every day I am not! I allowed my mistress, Julia, to adopt me. 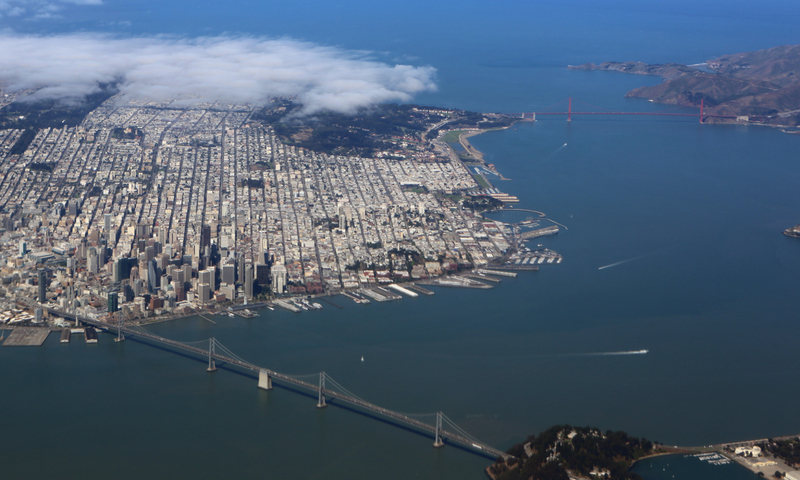 She’s an astrologer and we live in a comfy little apartment in San Francisco in the fog out near the ocean. Now, I have a good life, I admit. I’m well cared for, Julia makes sure I’m fed the very best of food, I’m brushed and cuddled. She takes me to all my vet appointments to keep me healthy. In turn, I protect the apartment and I guard her when her clients come to visit. Believe me, I make sure they know I’m keeping a close eye on them when they’re in my domain! Julia’s clients are acceptable for the most part, but I worry about her because they tell her all their problems and expect her to have answers to all their dilemmas, no matter how silly and foolish. She worries too much about her clients. In my opinion, her advice is excellent. Maybe if they listened better and took her advice, they be better off. It’s a hard job. It takes all my concentration, so as soon as our apartment is quiet I head for a treat and a nap. I like to nap. I’d prefer to roam around the neighborhood at night, but Julia won’t let me. She’s very overprotective. She lets me wander during the day though. One of my favorite things is to hop from our back stairs over to our neighbor’s roof. The surface is rough and gravelly and I like to roll around on it to scratch my back. We even have a little back yard with grass and I like to hide among the hedges and flowers. I don’t have a lot of friends because there really are no cats who are as beautiful and smart as I, but I have Julia and we have some great conversations. I just wish she didn’t run around the city so much solving crimes. If she’d stop all that nonsense, we’d have a much more peaceful life. You can read all about me in all the books of the Zodiac Mysteries. And you can visit my author Connie di Marco at her website, at Facebook and Twitter @askzodia. And best of all, this month at Killer Character’s Season’s Readings, there’s a giveaway! 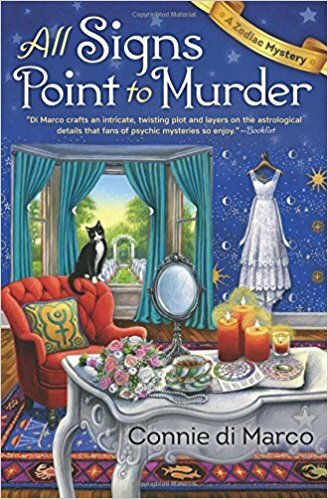 My author is giving away either one of her Zodiac Mysteries – The Madness of Mercury (Book 1) or All Signs Point to Murder (Book 2), or one of her Soup Lovers’Mysteries (written by her alter ego Connie Archer) The giveaway ends tonight at midnight (PST) (December 15th), so don't delay. Happy reading! I am a handsome devil, Carol. So glad you agree and Julia thinks so too! I used to have a black cat. He was amazing. We did too, Debby! We were heartbroken when he died, he was such a part of the family. That’s who Wizard was modeled on! Oh, Wizard, I feel you are too humble! Do you think so? Hmm, perhaps you’re right, I probably should toot my own horn some more! Hello Wizard! I know you're both gorgeous and very smart because you decided to make your home with Julie. I know you make an excellent protector as well. The only think is I feel for you having to live in all that fog. I can relate because I'm an old Army brat whose Dad was stationed in Fort Ord, CA for 9 years. Just never know when it's going to roll in and get you all chilled and damp. I'd love to read all about your adventures in the Zodiac Mysteries. Thanks for the chance to win one of the books! Oh, I don’t mind, Kay, I kind of like the fog. It’s very mysterious and I can creep around the neighborhood even better and no one can see me. I can even hide from Julia sometimes when she wants me to come in! I hope you get to enjoy our Mysteries soon! I do have a good life, and it’s all thanks to Julia. I’m so glad I decided to adopt her. She found me in an old abandoned theater where I was living in the rafters and I knew she needed me to protect her! It is a challenge to stay modest, Marla, given all my fabulous traits, but I do think I manage. I try to be understanding of other cats who aren’t as blessed as I. After all, no one could possibly be me! Hi Autumn, I will tell my author and it’s a pleasure to meet you too. Did you say FEMALE? I wonder if she could be a sister? I should tell Julia! I know you’ll just fall in love with me, Ruth! Julia and I have a wonderful life together! I hope you get to read about our adventures soon! Wizard, thank you for the chance. I've read the first book and loved it!! Hi Connie, i’m so glad you enjoyed my first adventure! I think you’ll really like All Signs Point to Murder. I was worried about Julia in that one, but I think I helped her solve the murder! Wizard, you have every reason to be proud of your looks! Dear Libby, it’s so nice to meet another admirer! Thank you! So glad you agree! I am delightful, aren’t I? Nice to meet you too! I was very brave! And Julia was really proud of me. I think you’d like our story, Mary! A pleasure to meet you too, Tati! Do you have any cats? My black cats are Muffin and Wiggles. Hi, Wizard! I’d love to meet them! And you’ve given them lovely names! I hope you give them lots of hugs!! Nice to meet you, Wizard. Julia is lucky to have you, especially since you protect her. Black cats are very handsome. Yes, she is very lucky that I adopted her! She tells me that all the time! Hi Wizard (and Connie) I'd love to have a copy of All Signs Point to Murder! I want to read more about Wizard. bobwiesmann at gmail dot com. Hi Barb, good luck! Julia and Wizard have a great adventure in All Signs Point to Murder! Black kitties are the best! Our black kitty lives on as Wizard! We miss him terribly too! Wizard, you are an exceptional cat! Looking forward to reading the next Zodiac mystery. 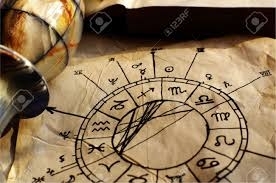 I can tell you like astrology! Julia thinks I might be a Taurus too, because i’m so handsome and I love my creature comforts. Our next adventure is called Tail of the Dragon, and I can’t wait for everyone to read it this summer!!! My pure black cat, Alesister, was also loving and sturdy at 20 pounds! Sadly, he crossed the Rainbow Bridge 2 years ago. My Licorice is black with a bit of white on his throat and Mystic is black with white on his feet, chest, and markings on his face! I also have a grey cat (Calumet), calico (Annabella), and ginger (Mariusz). Happy Holidays and good luck keeping your human safe! Hi Kathy, Connie here. I love your cats’ names! Wizard does too. You’ll notice that the drawing of Wizard on the covers shows him with a white ruff. The publisher said they couldn’t paint him as all black, I think because they were afraid he wouldn’t show up against the other colors. A few people have written to me about that, but make no mistake, Wiz is all black and very buff. We also had a gray male cat, years later, with one white leg and one white paw. I used to call him Mr. One Sock Up and One Sock Down. We miss him still! Oh Dianne, I love those names! Our cats have all been rescues over the years too! Do you remember an ancient TV show called Topper? I think that was the characters name, Cosmo Topper, and there was a Saint Bernard, but I don’t remember the dog’s name. My son's cat looks just like Wizard and is also 20 pounds. Her name is Ebony. Two of a kind. I also have two rescues that I've had since they were a week old (their mother brought them to me), and they are now almost 22 years old. Wow! 22 years old? That’s fantastic!!! I think black cats are very lucky, and i’ve never understood why they got the reputation of being bad luck. 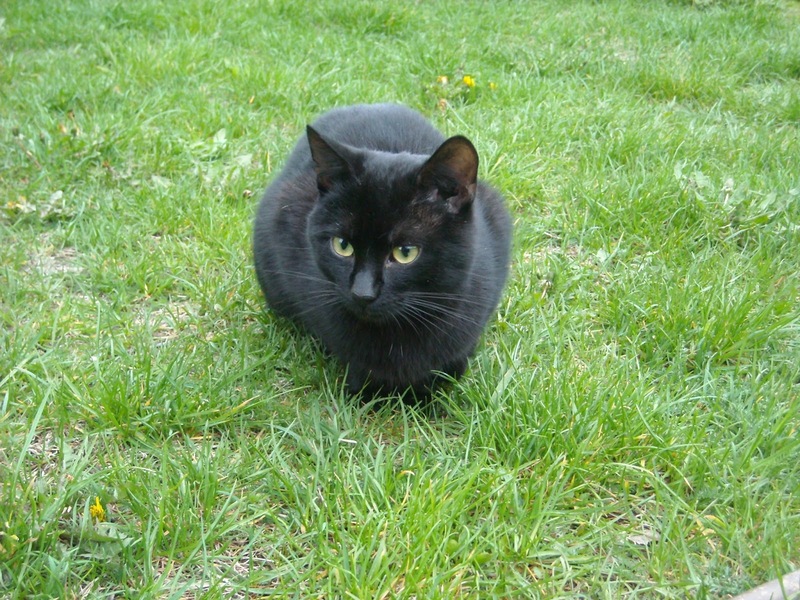 I wrote a post about black cats for one of the blog tours I did last year. You can find it on my website (May 2016) (conniedomarco.com) and it appeared on Musingsandramblings.net if you’d like to read it. You might enjoy it. A fun post thank you. Love the name. Hi Mary, thanks for visiting! I thought that Julia’s cat should have a mysterious name that suited her profession and had a magical touch. I went around and around trying to choose a name, but finally settled on Wizard. I think it was a good choice plus he has a nickname, Wiz! Hi,Wizard. My son's cat is named "M" because he is "M"azing. My dog is Puppy. He is 16 1/2 years old. 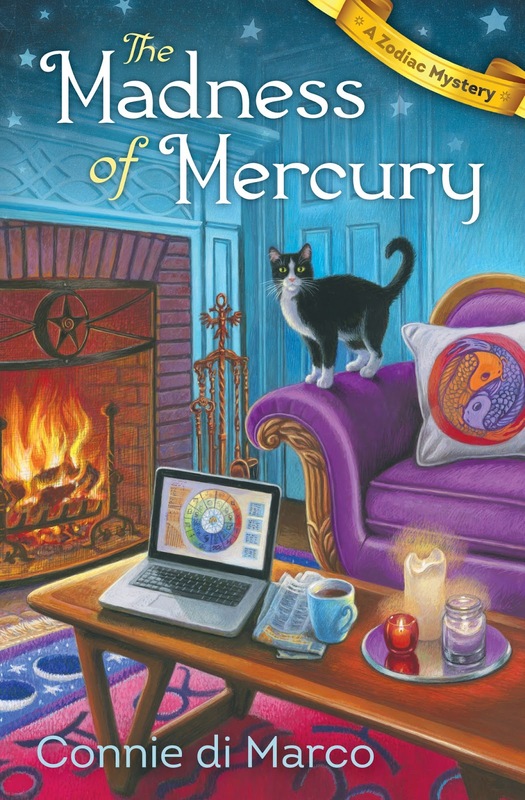 I would so love to read The Madness of Mercury as Mercury has been messing with my life for years. Oh Linda, I’m so sorry you’ve had trouble with Mercury! All I can say is, I hope you don’t have the kind of trouble that Julia runs into in The Madness of Mercury! And by the way, Mercury happens to be retrograde right now, until December 22nd. Check the air in your tires, and the battery in your car, and doublecheck communications. Checks get lost in the mail and all sorts of pesky thing happen. Not terrible, but annoying! Hi Jennifer, you’re very welcome! I love the days we do giveaways on Killer Characters, it’s so great to hear from so many people! Good luck! I’m so glad you think I’m magnificent, Eileen. I just hope Julia realizes how wonderful I am, and doesn’t take me for granted! You are one impressive black cat---I'd love to add you to my furbabies. Thanks for the contest. Hi Sue, how nIce to see you here! You can definitely add me to your fur babies. Would you like an autographed picture of moi? With a paw print? I’ll tell Julia to send you one. Best of luck! I really do worry about her and i’ve considered hiding in the back seat of her car. She’d never know I was there, just to keep an eye on her. Maybe I could even snag her keys with my paw and hide them in the apartment. Then she’d have to stay home! Time for a smart cat like me to take charge! Hi everyone ~ thanks so much to all for stopping by on my day at Killer Characters! I’ll close the giveaway now, but I’ll include everyone who entered even if they were a little after midnight. I’m just waking up on the West Coast and i’ll use random.org in a few minutes to pick a winner and be fair to everyone. Thanks again for stopping by and Happy Holidays to all, and happy reading too! Thanks again to everyone for visiting Killer Characters on my day. Wizard thanks you too! The winner of the giveaway is Barb W! Congratulations, Barb! I’ll send you an email and with luck I'll be able to add your name to our website! Happy reading! Thank you for the introduction to Wizard, Connie! Happy holidays! You too, Marla! Have a wonderful holiday season! sorry, late to the party. Sounds like a fun read. Hi Kathleen, better late than never! Thanks for stopping by! On behalf of my beautiful black cat, Romeo Luigi, Meowy Crispmas to you Wizard. We handsome black cats must stick together. Good luck in the new year, my caregiver will be watching for new books. Hi Robin, what a wonderful romantic name! I’ll bet he’s quite the ladies’ man! Thanks so much for visiting. Book #3, Tail of the Dragon, will be out in August. It’s a little soon for me to be talking about it, but I will as soon as I can! Happy Reading! 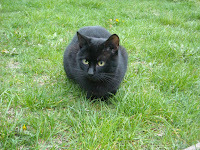 Hi Nancy ~ I can’t tell you how heartbroken I was when our gorgeous, cantankerous black cat died! He didn’t like strangers at all, but he’d curl up under the covers with me at night. He was an amazing cat! Oh, you’re very welcome! Stay tuned to Killer Characters because our giveaways will last till (I think) December 22nd or 23rd! http://www.musingsandramblings.net/2016/05/guest-post-madness-of-mercury-connie-di-marco.html#more And you can find it on the blog page of my website too.